It’s critical that your industrial manipulator or other lift assist device functions precisely how you need them to. After all, the safety of your employees, production speed and quality of your final product all depend on having the right tools to help get the job done correctly. 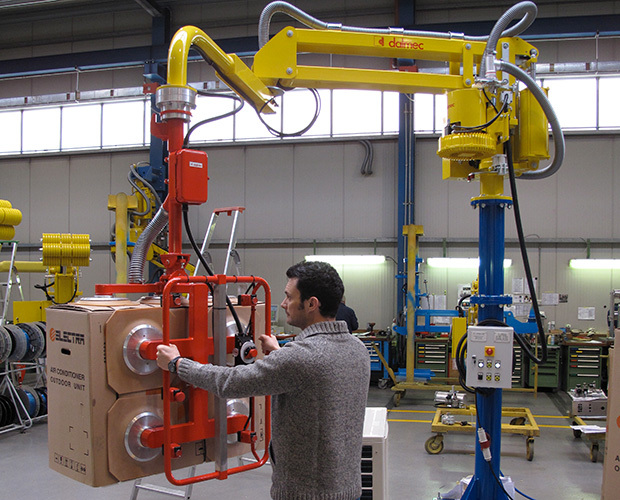 You have two options when searching for your next piece of material handling equipment: you can purchase a pre-made, out-of-the-box machine, or you can have your manipulator designed to meet the needs and specifications of your unique manufacturing environment. While the out-of-the-box solution may seem like the easiest and least expensive option, custom-designed manipulators provide the best value for your investment. While pre-made industrial manipulators may have a lower initial purchase price than custom-made machines, the cost is just that: initial. Unfortunately, many manufacturers find that their one-size-fits-all lift assist device are a source of frustration for their employees. Why? When a machine isn’t built to meet the exact needs of the manufacturing plant, there may be a gap between what an employee needs the machine to do and what it actually can do. For example, a standard machine may not be designed to reach as far as a manufacturer needs it to, forcing an employee to manually finish the job, moving an object from the farthest point of the manipulator’s reach to the final point of placement. This can cause employee injuries and slows down the speed of production. It’s also not uncommon for organizations to ditch their standard manipulator after a year or two of use, once the shortcomings of the machine become unbearable. As a business, your goal is to increase profits. Standard-made machines often act as a roadblock to your goal, as slower production speeds, worker’s compensation claims and employee absences caused by injuries, and replacement machine costs can come at a significant expense to your organization. When your material handling machine is designed with your manufacturing environment in mind, you’ll know that you won’t need to compensate for shortcomings in the equipment. A custom-designed machine should make your employees’ jobs easier and safer. Putting in place a device that makes moving components without risking bodily harm to your employees allows them to do their jobs more effectively. A safer workplace will result in reduced losses caused by worker’s compensation claims and employee absenteeism that stems from employees needing to recover from injuries. In addition to creating a safer workplace, a manipulator tailored to your facility will help your production move along at a quicker rate. Because there is no slowing down to manually fill in the gaps for what a standard machine is unable to accomplish, you’ll be able to fulfill more orders in less time. Sequence of operations: what is the end-user’s process for handling the component and what are the requirements of component manipulations from point of pick, to point of placement? A standard manipulator may be a reasonable solution if you are completely confident that the out-of-the-box solution will fit precisely into your manufacturing environment. However, a custom-designed industrial manipulator offers the reassurance that your machine will work exactly how you need it to.